July 31, at the Hydeaway. organizers of Sideponytail vs. The G20, going on this Saturday, July 31 at the Hydeaway at 10209 100 Avenue. Doors open at 9 p.m. and donations will be accepted throughout the night. Since her first all girl band, The Hardy Boys, stepped off stage for the first and only time, the Ottawa-raised O’Hara has been pumping out curious and transdisciplinary displays of creativity, living off the premise that “everything is a work in progress”. Starting out with a vocal processor that added affects on her voice, O’Hara soon began exploring with guitar pedals and a sampler in her solo work, adding a loop station by 2000 followed shortly with the necessary addition of feeding everything through a mixing board. As her unique performances developed into festival invitations from around the world and manifested in the release of her debut album, In Abulia, the premise of her art still resides in her skills as an improviser. Recently, O’Hara scored her first live dance composition for Studio 303’s 20th anniversary celebration featuring 20 different choreographed pieces set to her original score. Also accepting two years in a row the 52 Pick-Up video challenge put forward by artist Dayna McLeod, where participants face the demanding task of creating one video per week for communal viewing on the web, O’Hara has no shortage of projects on the go. 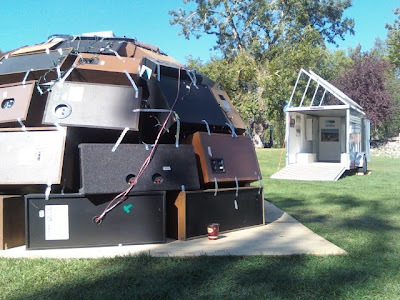 As of late, she has been receiving a lot of international attention for her SQUEEEEQUE project, an installation of an igloo constructed of feedback-responsive speaker boxes. Using found, used, and donated speakers of all makes and sizes, SQUEEEEQUE comes alive when audience members crawl into the igloo and activate the feedback system with the sound of their own voice. Fed through a series of microphones, SQUEEEEQUE has been mesmerizing audiences since debuting in Montréal’s Skol Gallery last summer, and has since been picked up by European curators in both Germany and France. Passing by TRUCK's CAMPER en route to Prince's Island Park, I ran into the duo of Chloe Lewis and Andrew Taggart, who were selected to participate in Calgary's Public Art Program’s six-part public art series, Celebration of the Bow River 2010. As creatively forlorn artists working in drawing, sculpture, photography, and longing, Lewis and Taggart are the first of three CAMPER residencies in the ol' 1975 Dodge Empress. Look for their next museum-related project, The Museum of Longing and Failure, opening in a storefront in Bergen, Norway, October 2010. For more information on their joint artistic practice, visit Lewis and Taggart. This week, Prairie Artsters visits the Singhmar Center for Art Education on the lower level of the Art Gallery of Alberta. Speaking with Education and Programs Manager Jessie Beire, Amy Fung takes a closer look at the exhibition, "artist as teacher, teacher as artist" showing until August 7. The lifeblood of any city lies in its streets, alleyways and sidewalks. The flow of traffic from the pedestrian and vehicular and everything in between has been mused upon as the rhythm of this modern life. If pressed, one can find a conglomeration of people in designated zones such as shopping malls, recreational parks (on sunny days), mega box stores or basically anywhere that supplies plenty of free parking. The flow of this city has unfortunately been shaped towards drivers, with many parts of the city inaccessible unless you drive or love riding the bus for hours at a time, and so that leaves very little face-to-face interaction between its citizens, giving sparse opportunities for physically seeing and hearing who we each are, what we look like, how we move, and answering the simple question of who actually makes up this city. For a region where there's only a few months out of the year where we can comfortably walk outside, the recent temporary pedestrian conversions of 104 Street downtown and the main drag of Whyte Avenue changed the feeling of living and being in this city, even if it was for a brief moment. The warehouse district on 104 Street shuts down its streets every Saturday during the run of the downtown farmers' market, and for the second year in a row, they extended that closure for an all-day/all-night block party on the same weekend as the Pride festival. For readers living anywhere but here, the concept of having a day out on a sidewalk patio may seem trivial, if not mundane, but for those who wandered around downtown that day, the treat of enjoying city life was a rare one. While there are scores of places, benches and green zones to wander and hang out in Edmonton, there isn't always a crowd to lose yourself in, which arguably is the very foundation for city life. The recent weekend of SOS Fest (Sounds of Strathcona Festival) shut down Whyte Avenue on either side of Calgary Trail and again the people came out in droves. The street filled with people for the free music performances all day Sunday, and the reoccurring comment heard throughout the day was, "Wow, this looks like a real city!" And somewhat sadly, that statement is true. Walking through a sea of strangers on a street in Edmonton is not a common feat, but it should be if we're ever going to be a real city with its own identity, concepts and style. For reasons from safety to simple activity, people need to see each other out and about doing things and living their lives. Giving privilege to pedestrians and pedestrian activity is the first step in connecting people to the city. Plans to activate Churchill Square with Tai Chi classes to follow the well-used basketball nets and skate ramps isn't too bad an idea. This goes back to urban theorist Roberta Brandes Gratz's notion that you have to make a city for the people who live there, above and beyond making a city in the model of world cities, because it's always been the specific character of the local that resonates into a reputation that draws life, visitors and commerce. The application of cookie cutter transplants into homogenous cityscapes that pursue sprawling development rather than pedestrians has contributed to the decay of city life, and for two weekends this summer, there was a glimmer of what this place could be. While the majority of the public's attention has been focused on the AGA's exterior along with the exhibitions circulating through the city's new art institution, down below all the hubbub, the Singhmar Centre of Art Education has been keeping busy fulfilling the gallery's public education mandate. With smart classrooms and a community gallery no bigger than 400 square feet, the education centre is currently featuring a cross-range of works by the gallery's educators and instructors, many of whom are active local artists. With a range of media from more than 10 artists/educators, the exhibition is an eclectic showcase of what the gallery is capable of featuring in terms of educational programming. While often the education connects back to the exhibition programming, there is room to develop what the educators are professionally interested in. "What I found most interesting is how they are all completely different," says Jessie Beier, Education and Programs Manager of the AGA. "The different styles are reflective of the broad range of what our educators can teach, and what we can offer." From fine painting and drawing of familiar names such as Scott Cumberland and Brenda Kim Christiansen, to mixed-media works by Dara Humniski and Dara Armsden, to cartoons by Spyder Yardley-Jones and photography by Elaine Wannechko, the show reads as eclectic, tied together by short personal statements answering how teaching influences their artistic practice. Similar to the set up of a faculty exhibition, this is as good a chance as any to do a survey glance at the different styles and levels offered by the gallery in terms of expectations for your practical art education. Demonstrating personal and professional teaching practices, the exhibition ends up stressing the artistic difference amongst their catalogue of teachers to the full benefit of the AGA's education centre. With classes of all varieties constantly on the go, Beire would like to push the programming further to keep the spaces constantly in use, including expanding classes to include installation as well as performance art. For now, with a handful of shows under their belt, the TD Education Gallery acts as a much-needed community gallery, showing a broad range of artists, from Junior High School students inspired by the Yousuf Karsh photography exhibition, to the grad show for Victoria School 30 IB students, to senior artists during the recent Creative Age Festival. "A huge part of our mandate is public education, and that includes children and adult learning. I'm always looking for ideas from local artists, because it's important to have a free space in this city to show work," says Beire, who also emphasizes the importance for those in each show to be part of the entire process from hanging the work to lighting to fully get the whole experience of putting together an art show. This week, Prairie Artsters goes to the Paint Spot to check out their summer shows and speak with owner Kim Fjordbotten about the upcoming Whyte Avenue Art Walk. In its 15th year, this will be the largest yet of the annual art sale, featuring over 300 visual artists live on Whyte Ave from July 16 through the 18th. Having received a sneak peak earlier this semester of the University of Alberta sculpture studio, and having caught several of these undergraduates' work during NextFest's "New Edmonton Artists," it would appear the next wave of Edmonton's sculpture students has dramatically embraced the creative possibilities inherent in contemporary sculpture. Returning to the figurative, along with installation-based presentations of pieces in various media from touches of steel, to treated wood, light weight plaster and even rice paper, the works gathered together for From the Human Body are a welcome change in breaking out the U of A's reputation as an abstract steel yard. Informed by courses and techniques taught by celebrated artists Isla Burns and Royden Mills, who both work in, but are not limited to, steel, the approach to sculpture evidently returns to a basic foundation of portraiture and formal transformation. Mills, who serves as both friend and mentor to his students, notes, "We're trying to encourage them during these years of development to have a solid grounding in the figure, and have self confidence in knowing they can do a classic portrait if they like, but shortly after that, we are encouraging them to develop personal expressions, self-investment and conceptual development in setting their own parameters for making work that has pertinence for people living in our contemporary world." Showing in commercial spaces the Peter Robertson Gallery and The Front Gallery, both located just a few doors down from each other at the west bend of Jasper Avenue, the majority of works are done by third-year students, which is surprising considering the level of sophistication inherent in many of the works. For example, upstairs in Peter Robertson Gallery, Jennifer Konanz's small works of treated and untreated paper cast over seemingly found objects held resonance. "You & Me," which features an object clearly tempered with thought and process, sits on top of two stacks of real and worn 4" x 9" mail envelopes. Pushing the concept of the pedestal to a new reality where nothing is stable or permanent, sculpture's preciousness and fragility is held up by something equally perishable and dependent. Downstairs, Carly Greene and Jessica McCoy vie for your attention with their preoccupations on the handsome aspects of natural wood grain, touching upon elements of surprise and formalities. McCoy is one familiar name from the "New Edmonton Artists" show, who had works throughout the main foyer of Enterprise Square including the piece "Procession," featured in the middle of Peter Robertson Gallery. With a small blackened pond upon the top face of the large lain lumber along with crafted handles on either end, McCoy suggests something beyond the immediate association of its title to death, opening up imagery of transformation through the Narcissus myth, and redefining the solemnness of a formal procession through sheer formal play. While the students' voices and styles are still rapidly changing and developing, there appears to be greater attention to experimentation and risk taking within the form, consequently revealing a maturity far beyond their years. Breaking out of the moulds, literally, of past forms and theories, the overall tone of this exhibition is one that balances conceptual process with formal techniques. As this is only the second year BFA undergraduates have been featured along the Gallery Walk in recent memory, the first being a partnership through Front with Peter Robertson coming aboard this year, the exhibition is a great opportunity for the students to develop their skills in a professional context. "We put them into these positions where they have to act like real professional artists, because they need to gain respect and support from people early in their careers," Mills shares. "The public, as well as friends and family, need to view them as artists now, as they will be hard times ahead, as to get to the top of your fields, you are going to have to pay your dues." On a recent road trip through Saskatchewan, I had a chance to visit The Mendel Art Gallery in Saskatoon and both the Dunlop and Mackenzie galleries in Regina. Varying in programming, the exhibitions included an Adrian Stimson solo exhibition and the excellent Jen Budney-curated Innocent Years group show, featuring renderings from three international artists' childhoods during significant 20th century shifts. Also up for viewing were the Canadian premiere of Geoffrey Farmer's Ongoing Time Stabbed With A Dagger—his first use of kinetics that had a world premiere at the Art Basel in Miami Beach—ex-Edmontonian Sylvia Ziemann's Possible Worlds and an interesting contrast between James Henderson's historical representations of First Nations identity answered back with to be reckoned with ... featuring works such as Nadia Myre's "Indian Act" and Ruth Cuthand's "Trading". What all of these exhibitions have in common, besides being in Saskatchewan, is that they are all free, all the time. The most direct result of having your galleries and institutions accessible to the general public is the diversity of the audience, and subsequently the experience for the audience. The first person I passed at the Mendel after the clear donation box filled with colourful bills was a woman sitting on the floor with her tattered backpack, back against the wall, watching Marjane Satrapi’s Oscar-nominated Persepolis attentively. She was laughing aloud at times and clearly the only one who watching the entire film. There was a cross range of families with strollers and walkers pointing to things and talking to one another, young men and women roaming from piece to piece, and a single guard who supervised unobtrusively. Grabbing a bite at the gallery cafe, my travel companion and I each had a fresh lunch that came under the admission price for most cultural institutions. While the impending future of the Mendel remains uncertain as a brand new building is on its horizon, I can only be reminded that the experience of art in the modern age of galleries and museums has become an inclusive one, where admission prices and lineups can become headlines and viewership dangerously becomes a class and income issue. In our own AGA and galleries from around the world, I have experienced firsthand, heard troubling accounts, and witnessed guards ask audiences to quiet down, step back, and in one case, ask a mother and her children to leave because her kids were getting too excited about the art. All of these accounts were from institutions where you felt watched as you walked around, where guards hovered over you as you were simply looking at art, fearful that somehow the art will be desecrated. While vandalism and ignorant behavior certainly exists within this realm, there is a marked difference between an errant child with chewing gum and those who just wish for a closer and longer look. Sometimes we accept this lording behavior on how to view art as we fall prey to the elitism of being in a gallery, that there must be rules and decorum that govern how we look and how long we look for. But that is that what we are paying for? To be policed on how we view and who gets to view? As I was reminded at the Dunlop, located in Regina’s central library, a young man asked to bum a smoke off me on my way into the library. I shrugged I didn’t have any. Farmer’s sculpture installation dominated the majority of the gallery, assembling shapes and dimensions and clocks wearing bowler hats into a theatrical presence, and unfortunately not quite successfully integrating movement into his contemplation of time. Walking around the piece a few times, a gallery staff came up during a pause and offered to discuss the work further if I had any questions at all. The young man from outside had come in by this time and come up to me again. Only this time he asked, “Do you think this is art?” I shrugged yes. The gallery facilitator quickly joined the conversation that unfolded into tangents of inspiration, street art, graffiti, surrealism, collage, and kinetics. There was no didacticism or underestimating going on, we didn’t have to lower our voices, there was simply an open conversation on art between three strangers from different backgrounds, and we all walked away from the encounter learning something new, if not profound. Just because the word "art" is in the title of the exhibition, there shouldn't be a natural assumption that The Art of Warner Bros Cartoons will actually be art. I don't want to dismiss the show entirely, as it's completely enjoyable and it's already becoming a summer favourite for adults and children alike, but still, after taking in the show, I'm left wondering what this exhibition is doing on the walls of an art gallery. The exhibition has been touring across North America since 2005 and was originally part of a four-month tribute to animation at the Museum of Modern Art in New York City in 1985 that was greatly expanded upon into this current display. Just coming from the Winnipeg Art Gallery, where I heard its bemoans from way over here, I tried to keep an open mind before entering the show about not just what the show is about, but what a gallery could show. One major criticism I have for the show is that the art of the machine, namely, the Warner Bros brand, is what is raised as artistic impetus and not the names and artisans who collectively worked on the cells and who largely remain anonymous. The production of animation often raises comparisons to sweat shops and though I'm hoping the working conditions are better, this show does nothing to give insight into the labourious part process of the show, with minor information on production and immense focus on the history of the recognizable favourites such as Porky the Pig and Tweety Bird. So while I strongly believe animation certainly holds a valuable place in the realm of art history, this show unfortunately focuses too narrowly on just the achievements of Warner Bros the company. Disney of course looms over the exhibition, with minor mention of the conglomerate giant in a competitive light, but I felt that was redundant, as Disney cartoons were fundamental to bringing animation into the minds and hearts of the general public. The main difference between the two are of course the inherently Americana feel of Warner Bros, which led to a more focused political and social subtext on America. As a Hollywood animation studio that ran for nearly 40 years until its closure in 1969, Warner Bros has certainly received its fair share of mass and critical acclaim, and here is where it becomes muddy why this show is at an art gallery. As a multiple recipient of Academy Awards, Warner Bros is certainly highly regarded for its artistic achievements, but this fact also reinforces that cartoons remain in the realm of motion pictures and a gallery exhibition dealing with mostly stills falls flat. My greatest concern with this exhibition is that it simply is not an exhibition that belongs on a wall, no matter how historically important it is to the history of art. I can see how this show may fit into the context of the gallery's museum mandate, but the primary difference is that most film and television museums convey their visual information very differently, namely stretching out a chronology of its development in the medium of the moving image rather than just focusing on facts and diagrams. 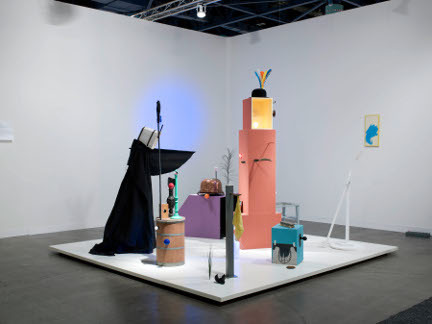 While there are video stations within the exhibition, the show could have infinitely benefited from far more stations that showed the development of its production in the medium in which it was meant to be seen. Click the title or here to read the summer 2010 update from Lethbridge, Banff, Edmonton, Saskatoon, and Regina. First published on Akimblog, July 6, 2010. Taking the sojourn through downtown Edmonton on opening day, I walked through the 25th edition of The Works Art & Design Festival with little to no expectations. It's been quite a number of years since The Works has offered something of note and intrigue, appearing to grow stale in its mandate of being a summer festival that brings visual art to the downtown public. While the majority of works remain entirely missable if you are not seeking them out, The Works—to nobody's greater surprise than mine—was not an entirely frustrating experience this year. One reason I may have cringed less was a noticeable increase in artists as curators, from Calgary-based Natali Rodrigues' highlighting of contemporary glass work at the Hotel MacDonald, Shane Golby's selections of works addressing trees in the lower level of the AGA and Lynn Malin's "Earthscapes" exhibition at ArtsHab. Offering small bites of cohesion through an otherwise ramble of works, events and tents, the smaller, curated shows within the overall festival appear to be working; if the festival itself is not going to be curating such exercises, then it should be a place to facilitate them. A major notable recurrence with this year's Earth theme was new media, with three stellar works by Olivia Kachman, Bob Lysay and Agnieszka Matejko, and Sandra Vida. Just north of the Square, Kachman takes over a large section of the big tent by filling it with flat screens, log stumps, and piles of fragrant wood chips. Darkened into a cavelike setting, Kachman, who is also one of several artists featured in this year's Square line-up with strong ties to Grande Prairie (the other two being Laura St Pierre and Tina Martel), presents "Out of the Blue and into the Red," a multiperspective installation on the impact the oil and gas industry has on Northern Alberta. Situating perspectives of close to 200 different voices in the round, or around the fire, Kachman immerses her audience immediately into a group dialogue where we are invited to take a seat in nature, or what's left of it, and be mindful of what is actually happening right now to the earth. Also shedding light on the humanity of industrialization, Vida presents her latest, "Threads" in the Centennial Room down in the lower level of the Stanley A. Milner Library. Continually evolving her practice as an incredibly active and vital media artist in Calgary for decades, Vida goes beyond her video and sound realms to incorporate elements of soft sculpture with projection to convey a story of both personal and contemporary labour politics. Never comprising the historical narrative in favour of the more personable, Vida rather quite successfully intertwines the two through a methodical rhythm of both image and sound. Deviating from the theme, but perhaps one of the strongest works this year, Lysay and Matejko's video art installation "The Space Between You and Me" addresses young adults with Tourette Syndrome. Matejko, who often creates works exploring the sublime, facilitates the expressions of the youth into a multifaceted hall of mixed realities and mirrors. Situated in The Enterprise gallery space, the work as a whole attempts to convey a sense of honesty between the expressions and its formal counterparts, fracturing clarity and complicating the ways in which we communicate with and understand one another. My consistent dismay of The Works has been a growing concern about its irrelevance as a festival and destination to artists and art audiences and its alienation of art as something that has to be watered down for a general public. While the festival is still doing far too much and spreading itself far too thin, this is the first time in a long time where I left having seen a number of thoughtful works, or at least a handful of works that countered the questionables and the mundane, which is all anyone can ever hope for when they go "see" art.